I am so sorry to hear you have lost Mabel. She is now at peace with her sister. 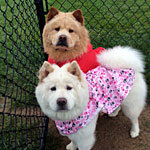 Those two beautiful chow girls must be having a ball together over the rainbow bridge. We will light our candle for her tonight. It's been almost 3 years since I posted on behalf of Fred and Judy regarding Milly. Sadly I am here posting again about our dear old girl/your dear old friend, Mabel. As you all know Mabel was devastated when her sister died but did perk up with the whirlwind arrival of number three baggage, Matilda, who puts a whole new dimension on waltzing!! Baggage number 4, Maisie also contributed in a huge way to cheering old Mabel up. However, old age, illness and that forever present hint of heartache for her sister were the contributing factors to Fred, Judy, two vets & myself releasing this precious old girl to the Happy Hunting Ground. 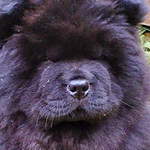 I have no doubts she'll get there via The Rainbow Bridge and there will be plenty of Chows Chows proud to play and guide her! My mum and dad are, as you will understand, heartbroken, but it is also a huge relief. Old Mabel had recently deteriorated quite drastically and had developed a whole amalgam of problems. Her eyesight was incredibly poor, her spinal bones had fused together etc. etc. She had a lovely peaceful afternoon in the sunshine before making her final journey. She went to sleep in the most dignified and peaceful way that only a Chow Chow lady who has had enough can do. My mum and I took her and that little old lady regained the dignity that the cruelness of age and illness had attempted to take from her. Mabel won! Milly too has won! One day I'll post something good for you all. 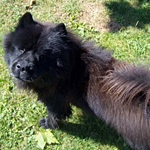 But in the meantime please say a little prayer for another little old Chow Chow. Judy, I am so sorry to hear about Mabel. My heart goes out to all of you. I know how hard it is to let go and I'm sure you know that you did the right thing at the right time. Mabel is with her sister Milly again running zoomies. I just want to hug you all tightly. I'm so sorry to hear of Mabels passing. 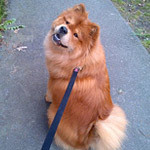 Enjoy and be at peace KNOWING that she had an incredibly life with soo much love, happiness and fun and now is sleeping like only a chow can do. Again my sincere condolensces to you all. Our prayers and love to you for your loss of Mabel. 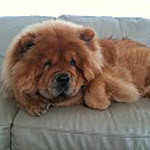 She is with her sister now - running, gardening, and waiting for you at Rainbow Bridge. I am very saddened to hear this news. My thoughts are with you and yours. Mabel is running around with Millie now and they both will be at the bridge waiting for you. She had a long and loved life. Take care of yourselves. The Maiden Aunts are together once again. "Say not in grief she is no more, but in thankfulness that she was." Sweet, sweet Mabel. To Judy and Fred and your whole family: My sympathy goes out to you all. Mabel ,I know is with Millie now having a run around the rainbow park, I hope you all are doing okay.. I know how hard it is. She was a grand old lady chow to us here at the forum.. The best Chow girl anyone could dream to have with them...my deepest condolences to the Fox family. Oh hello Mrs Judy Fox. My heartfelt condolences to you. We didnt even know Mabel is into a lot of trouble. It was indeed a sad day but a day that needed to be faced and I was glad Rhiannon was up with us to help us face it. Yesterday was a relief - our precious old girl was no longer in pain and we were content that she is in The Happy Hunting Ground with Milly but this morning was tough - dishing out breakfast for Matilda and Maisie - only two bowls not three. Tough, but as Zhuyo's Mom said, "The Maiden Aunts are together again". Oh Judy I am so sorry to hear of Mabel's passing. She was a special girl! My deepest, heartfelt sympathy is being sent your way. Tears trickled down my cheeks and a lump came to my throat as I read of Mabel’s passing. She may be gone physically but she’ll always be in you’re a heart and in the memory box in your mind. I personally know it’s a heartwrenching decision to make when the time comes. We step outside of ourselves and do it so they can go with dignity because they deserve it! I was in your shoes a little over a year ago. I had Chloe’s vet come to my home because it always un-nerved her to go to the vet’s office. After she went to “sleep” a peaceful look came over her and she looked young again. At such a sad time, it was a beautiful thing. In my mind’s eye I can see Mabel and Milly sitting side by side catching up on things. When the time comes and you leave this earth they will be waiting for you at the Rainbow bridge. Thank you all again - I am sure you all know your thoughts and prayers mean such a lot and I know you all understand how we feel. Pam - when the vet's injection took effect and Mabel relaxed and eventually "fell asleep", she looked so much younger with no sign of pain and that is what made it all better - the pain had gone. Chowdad - she is indeed with her precious sister Milly and I bet they are having a good natter. They loved each other so much and Mabel broke here heart when Milly died. Oh how very sad. I am another that has shed a few tears reading this thread, I am sure the Fox family has shed lots lots more. What a huge hole in your hearts. I'm so pleased Mabel went peacefully and I am so sorry you have lost your wonderful dear friend. I'm so so sorry to hear of Mabel's passing. My heart breaks for y'all..... 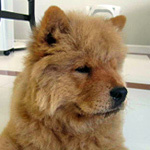 But I'm sure Milly and so many other chow babies, like Tippsy and Cinder, were at Rainbow Bridge to greet her when she arrived! Last edited by Tippsy'smom on Thu Aug 09, 2012 7:15 pm, edited 1 time in total. Yes! 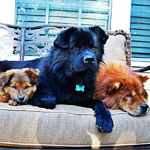 I am sure that all the Chow Chows were "Harrumphing" her across the bridge - Milly leading them, me thinks, with all their beautiful tails wagging and all their lovely chow smiles. I am so sorry for your loss. It brought tears to my eyes to read this. Those of us 'across the pond have' have love for your girls and share in your heart ache. I am so sorry! So sorry for your loss and so pleased that Mabel was obviously loved and well-cared for and given the most peaceful and dignified passing. So sorry for your loss. Thank you for sharing her life with us, I feel as if I knew both of you personally. Rest in Peace Mabel, Milly and you are together again.